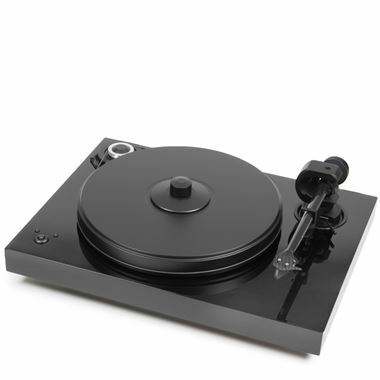 The 2 Xperience SB DC is the latest evolution of the 2 Xperience turntable from Pro-Ject. This high-quality turntable, suitable for mid to high-end systems now hosts a plethora of improvements from its predecessor. The deck provides minimum resonance with its heavy MDF plinth made using non-resonant construction techniques. The precision sandwich platter offers the perfect vinyl play back surface with its non-resonant properties and an ideal top surface to place your vinyl directly on to. The new 9V AC motor allows for pristine play back speed and with the ability to switch between 33 and 45 RPM at the push of a button. The speed control mechanism is powered by a new DC power supply in order to achieve a clean noise-free electrical signal to the motor. The 2 Xperience SB sees the inclusion of a 9CC Evolution carbon fibre tonearm that adds to the already audiophile grade package as well as being fitted with an Ortofon 2M Silver cartridge. The 2 Xperience SB DC is available in Olive, Walnut, Mahogany and Piano Black.